A new year may mean a new you, but it should also mean a new junk drawer. What's more stressful than digging through a pile of literally everything to find the one thing that you actually need? You might as well hunt for a needle in an entire barn's worth of hay. 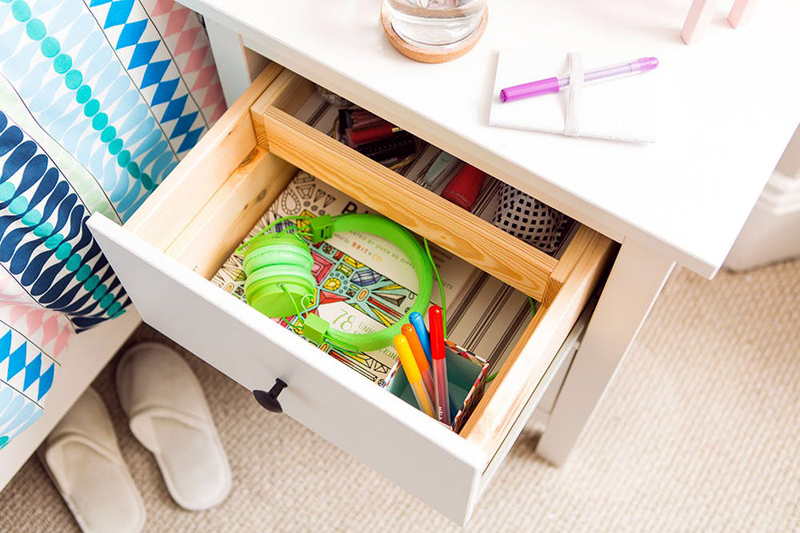 Dedicate this year to organization — starting with your junk drawer. These seven tips will transform your dreaded pit of odds and ends into a glorious ode to simplicity. You can't organize your junk drawer if all of the bits and bobs inside remain in a state of chaos. Before embarking, removing everything and place it on a single, flat surface — ideally, a large table, or even the floor. Got multiple annoying junk drawers? Consider tackling them all at once. You'll never get an opportunity this divine: an empty drawer ready for cleaning. First, vacuum out every crumb. To finish, wipe down your drawer using a microfiber rag dipped in a solution of liquid dish soap and warm water — learn exactly how to do this here — so you don't ruin the wood with harsh cleaning chemicals. Or you can opt to buy a gentle product such as Method's Daily Wood Cleaner ($5.89) instead. And don't forget to clean the outside, too. Feel free to throw an episode of Tidying Up With Marie Kondo on the telly while you complete this step and soak up that inspiration. Marie's calming presence can help you tackle any obstacle. Go through your pile one by one, asking yourself: Do I really need this? Or is it a mere tchotchke? Set aside anything that would be better donated or thrown in the trash. Turn your mess into piles. While you're setting things aside that don't spark joy, divide everything you want to keep into categorical piles. Separate out the pens, lump keys together, and stack all of your receipts. This step is essential to creating the perfect organizational system. Once you've divided your "junk," consider where each pile should live. Drawer liners aren't just for looks. (Although it can be fun seeing a cute pattern, like the black and white stripe liner from The Laundress ($17.99), every time you reach for a rubber band.) Liners will protect your drawers from food, water, or ink stains, and make cleaning up dust and particles much simpler. You could even use scraps of leftover wallpaper if you don't want to spend your hard-earned cash. Pro tip: Try cutting a piece of rug padding to size to keep your organizers from sliding around. Your junk drawer can't be truly streamlined without organizers. But don't think you have to drop serious cash on fancy organizers (unless you want to). First, consider what you already have at home — tiny pots, empty shoeboxes, and old jewelry boxes may serve you perfectly. Take a step back to admire your beautifully organized drawers. Then, commit yourself to maintaining the system. Don't toss receipts into drawers willy-nilly. Pens always go in the right container. Put all of the paper clips into the dedicated tiny pot. Practice these habits for a few weeks, and before you know it, you'll find they will soon come naturally.